‘Tis the season for soups! Luckily there isn’t a vegetable that doesn’t love to be in a soup. During the holiday season I specifically look to find ways to save a few dollars on my meals to help offset all the money spent on presents, traveling and key dinner parties. Carrots are cheap, nutritious and loaded with flavor. Hearty carrots and celery swirl with garlic and ginger while the orange zest adds just a hint of freshness. 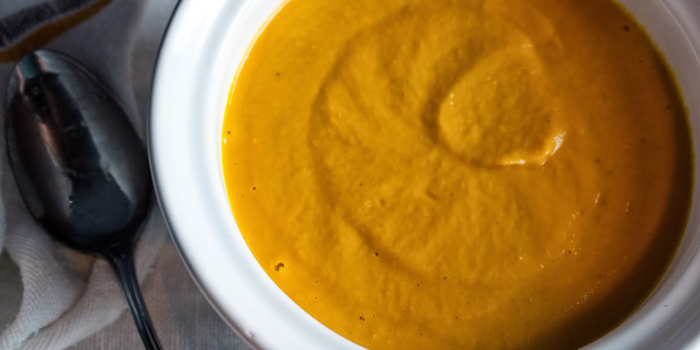 This carrot soup may sound humble, but it’s rich, creamy and delicious enough to be the entry course for any elegant meal. Keep warm, receive great nutrients for a beautiful body and fight cancer with this yummy Fat and Happy Ginger Orange Carrot Soup. Clean and rough chop the carrots, celery and onion, sauté in 2 tablespoons of coconut oil until they begin to soften. Add in the garlic clove and ginger and continue to cook until the garlic is softened but not burnt (about 5 minutes); add in additional coconut oil if the pan is too dry. Deglaze the pan with 12 ounces of the vegetable broth, cover and set to simmer until the carrots are completely softened. Pour the mixture into a blender and add the orange zest and a good pinch of salt and pepper. Carefully blend on high until the soup is smooth, adding a little more broth if needed to achieve a smooth consistency. Return to the same pan and add additional broth to reach desired consistency. 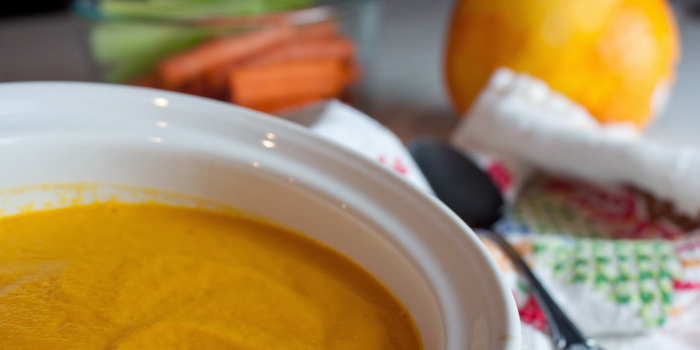 This Ginger Orange Carrot Soup is on the Happy Eats Healthy detox kicking off on January 5th. Are you feeling sluggish, tired, itchy or heavy? Has your skin lots its glow? Are you experiencing indigestion? Is your body in need of a cleanse? Click on the14 Days to Fabulous Cleanse for more information. Fat and Happy Food Blog Tips and Techniques: This soup freezes well. My suggestions is don’t add the second half of the broth after blending; freeze the soup more concentrated. Then add additional broth when reheating after defrosting to achieve desired consistency. Use organic vegetables when possible.